As an Owens Corning Preferred Contractor, we are proud to be a member of an exclusive network of roofing professionals who meet strict standards. 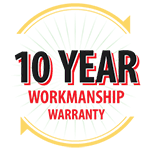 We provide a 10-year workmanship warranty for your peace of mind. We provide a GAF roofing warranty for our customers.